The Sazerac is one of the oldest cocktails still commonly consumed today. Invented around 1830 in New Orleans (where all the classics seem to have come from) by a Creole apothecary from the West Indies named Antoine Amadie Peychaud, the drink’s original recipe called for cognac, bitters, sugar and a dash of water. Incidentally, this concoction was pretty much the only cocktail recipe back in those days—something now referred to as the Old Fashioned. Antoine’s particular approach and proprietary bitters were so popular that bars (or “Exchanges”) all over NOLA started serving it. Legend has it that a man named Sewell Taylor, owner of Merchants Exchange Coffeehouse, was serving the drink at his bar when he became the sole importer of Sazerac-du-Forge et fils Cognac. 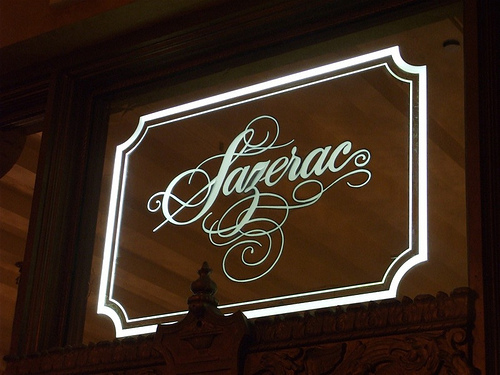 Shortly thereafter Aaron Bird took over the Merchant’s Exchange from Taylor, who had gone full-time into importing, and changed the name to Sazerac House after the liquor in their signature drink. And the first branded cocktail was born.